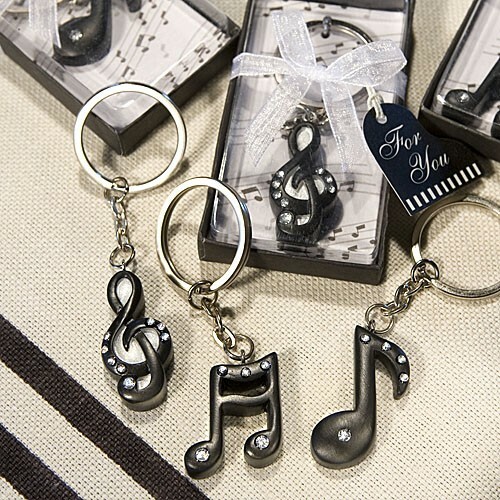 Your guests are sure to be singing a happy tune when they receive these whimsical musical note keychain favors at your event. 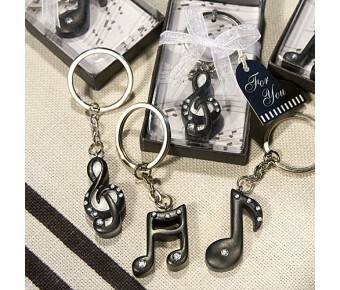 In perfect key for any music filled occasion, the key chains come in three assorted notes. Each measures 3.25" x 1.25" x 0.25" with a rhinestone-embellished black resin note charm connected at its top to a sturdy chrome chain and ring. Sold only by Fashioncraft, each is packaged in a deluxe box with a clear top and musical note design base, tied with a white organza ribbon and an attached piano shaped "For You" tag.